The new East Stand development was designed by lead designer KSS and also architect on the project, and worked with Wildfire London on the interior design concept and delivery. The expanded East Stand is now said to offer six floors of event space, including eight brand new facilities. The British Airways Rose Garden is the new roof terrace on Level 5 and has been reportedly been designed for a fun and immersive experience. 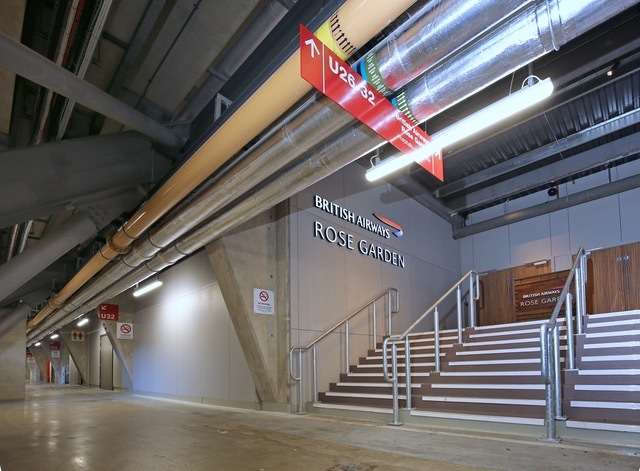 Cembrit HD board is installed in the Rose Garden itself, in the wings of the facility, as well as on the walls of the adjacent L5 concourse where impact resistance was said to be important as crowds are moving in confined spaces. Some of the wall finishes in the Rose Garden are also fixed through the Cembrit boards, including the brick slips behind the rotisserie section.